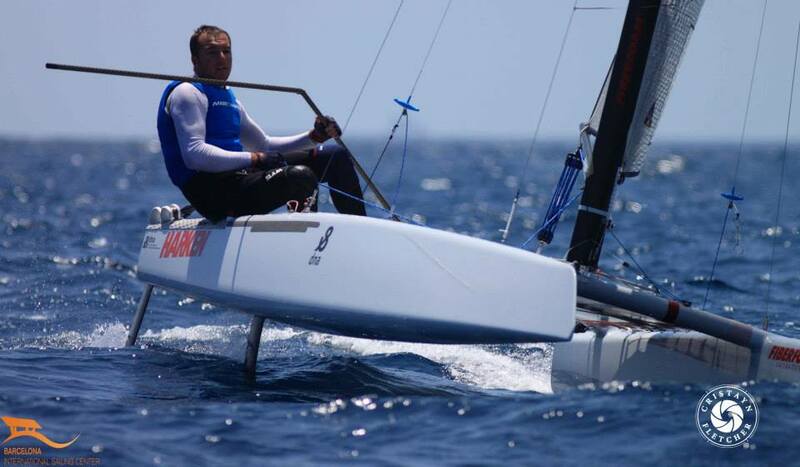 Rest day so we took advantage and contact local sailor Manuel Calavia to tell us how everything is going at Barcelona. Manolo is performing with 4,1,1,6 but had a bfd and a dns, here he tell the story. Image Cristayn Fletcher. More images at IACAs FB. "Today is Lay Day although some are sailing. Really good 10-12knots today. My dns was due my trapeze ring broke I pitched and went to the water, also I broke my carbon stick so I decided to return to shore and change equipment for the 2nd race of the day. Without that breakage I would be now 2nd with 14 points, a pity but still much to come. Steve Brewin is sailing quite good and fast in every condition. Mischa with less wind is a little back and Landy quite consistent in every race. I think Steve and I are really fast and racing good. I had bad luck but as said more races coming. The course is being quite tricky on wind changes and speed, the thermal wind is not entering that strong making the course more challenging. On equipment all doing good NIkita, DNA , Scheurer and the Exploder is making a good impression. Sails the same with Brewin, Ashby, Landy, Misha, Hammer etc. Finally we have Gustavo Doreste , 2nd in our Nats , doing good defending our Spanish flag. Tomorrow two more races and we expect thermal 10-14 knots. Two finals for me as I don´t have more discards!"